The 18th-century dresses would always be measured theatrically and sensually by the drapery-parted opening of the skirt (open robe) to reveal underskirt, petticoat, or a like dress. 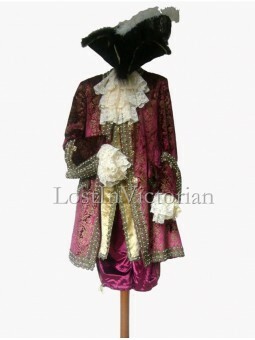 Polonaises and gatherings to flanks as the sign of the 18th century gowns are positively placed on the screen of attention. 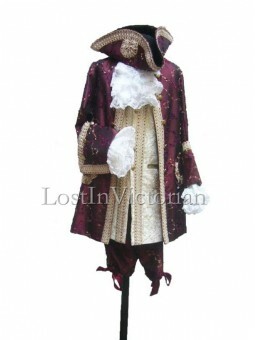 Men wore various individual pieces to create a fully suited and polished silhouette. Garments generally stopped at the knees, meaning that pants and coats were far shorter to show silk stockings. Undergarments were always linen. 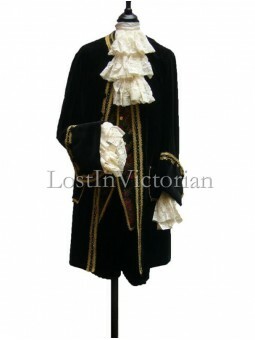 The typical underdress was a frilled shirt with long underdrawers, and undershirts were covered by long sleeved waistcoats or vests. In the mid-eighteenth century, children began to wear simple loose cotton dresses, while before the eighteenth century, children wore smaller versions of adult clothes. 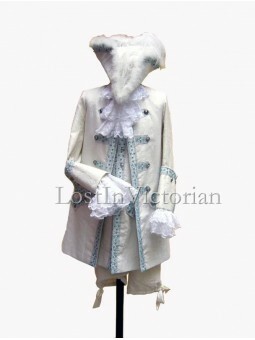 This was developed due to a change in thought that children could move more easily without tight corsets and long coats. 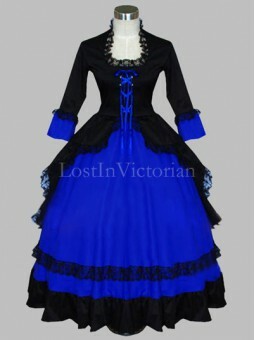 Fabric: SatinShown Color: Blue & BlackIncludes: Bodice, SkirtThe hoop skirt (worn under the dres.. 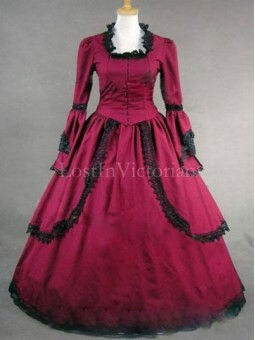 Fabric: Cotton, LaceShown Color: BurgundyIncludes: Bodice, SkirtThe hoop skirt (worn under the dress.. 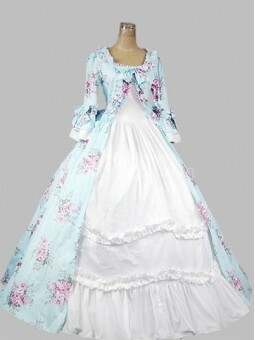 Fabric: CottonShown Color: Light Blue & WhiteIncludes: DressThe hoop skirt (worn under the dress.. 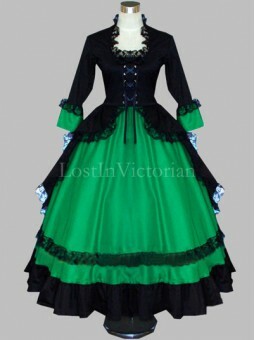 Fabric: SilkShown Color: Dark GreenIncludes: Overskirt Bodice, UnderskirtThe crinoline (worn under t.. 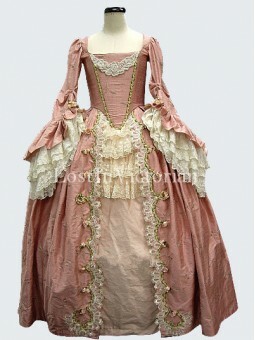 Fabric: Silk, LaceShown Color: Pink and White Includes: Overskirt Bodice, UnderskirtThe hoop skirt (.. 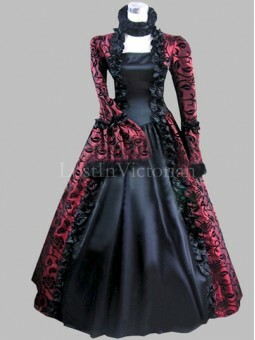 Fabric: Brocade, SatinShown Color: Burgundy & BlackIncludes: Dress, ChokerThe hoop skirt (worn u.. 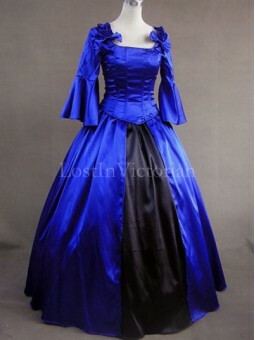 Fabric: Cotton Silk-Like, LaceShown Color: Black & BlueIncludes: Bodice, SkirtThe hoop skirt (wo.. 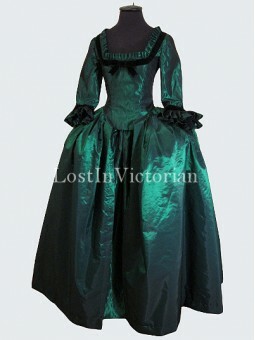 Fabric: Silk-Like, LaceShown Color: Black & GreenIncludes: Bodice, SkirtThe hoop skirt (worn und.. 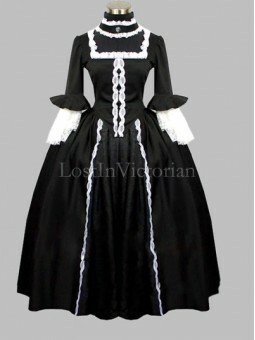 Fabric: Cotton Blend, LaceShown Color: Black & WhiteIncludes: Bodice, Skirt, Choker The hoop ski.. 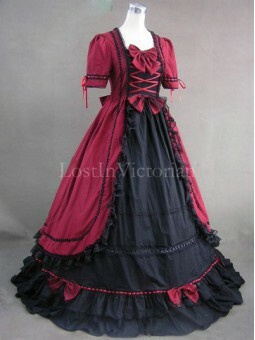 Fabric: Cotton, LaceShown Color: Burgundy & BlackIncludes: DressThe hoop skirt (worn under the d.. 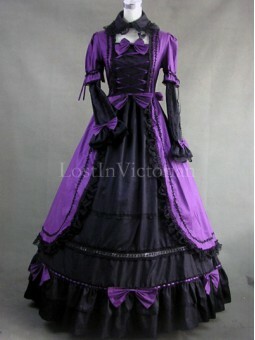 Fabric: CottonShown Color: Purple & BlackIncludes: DressThe hoop skirt (worn under the dress) is..